This event ends in 6 days. To unlock this tier, you need to spend 499 AP! Valentine's Day is around the corner! All you need is the final touch - a Wedding Costume or a powerful jewel! Upon use, you will receive one of Christmas Ring, Christmas Amulet or Christmas Bracelet. Resurrect in the nearest town or dead point with 50 percent of HP, SP, MP. For Ultimate Mode characters, they will resurrect in the town automatically. Restricted to characters in possession. Increaes STR, REC, INT, WIS, DEX, LUC by 30 for 10 minutes. Effect will be removed when you die. Allows user to access the Warehouse for five minutes without having to speak with the Warehouse Caretaker. One time use per Rune. This Mystery Box gives you a chance to get one of the brand new Noble Costumes. It contains the 30 day version at a fair chance and if you are lucky you can even get a permanent Noble Costume! 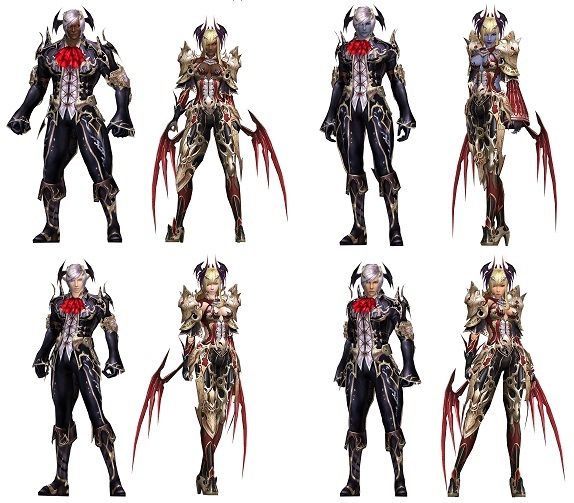 These costumes grant +15 to all stats, are bound to your character, can be dyed and can be recreated! Keeping this item in your inventory will protect your items from breaking when attempting to combine them with Lapis. This will consume the Lucky Charm. This item allows for the chance to get additional "orange" stats on items. After activated, grants 5x more EXP for 1 hour. Effect will remain even after death. The EXP bonus stacks with the Red Phoenix, Blue Dragon, and White Tiger charms! Restricted to characters currently in use. Increases the chances of linking a lapis by x1.8. This percentage stacks with Bless and level bonuses, but cannot exceed 50%. 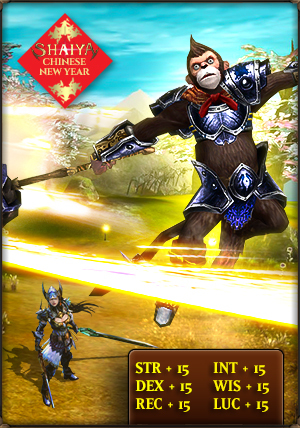 This Mystery Box gives you a chance to win one of the brand new Chinese New Year items - the Eden +15 costume. This box contains the permanent and 30 day versions at a fair chance. Try it out now! To unlock this tier, you need to spend 1499 AP! Get your Blood Avenger now! Upon death, resurrects the player in the nearest town or spawn point with 50% HP, SP, and MP. Ultimate Mode characters will be resurrected in the nearest town automatically. Restricted to character in possession. A Perfect Radiant Lapis that increases attack-speed by 3 levels. Can break the equipment if the link or extraction fails. With this service you get 1 pre-upgraded piece of armor of choice, with +15 enchantment level, 4 maxed OJ-stats and 1 of those with a doubled recreation. Armor means the following pieces of equipment: Helmet, Breastplate, Gloves, Pants, Boots. HP/SP/MP can not be doubled. More info in the GM services dashboard. 80c (Luminous set) Helmet of choice. More info in the GM services dashboard. Box containing a Perfect Armor Lapisia. Box containing a Perfect Weapon Lapisia. Doubles the points received by killing opposing faction members for 24 hours. Only effective on Yellow Grade characters. Resurrects character in the nearest town with 50 percent of HP, SP, MP for 30 days after use. Requires Ultimate Mode. Click to Activate. Resets stats. For stats received from the Excellent Warriors Manager, you must go back to the manager and get it again. Restricted to characters currently in use. Resets distributed skill points and places them back into the Usable Point pool. In order to initialize it, you must empty the 3rd, 4th and 5th Inventory tab. Restricted to characters currently in use. Increases STR by 100 for 2 hours. Effect vanishes after first death. Increases DEX by 80 for 2 hours. Effect vanishes after first death. Increases REC by 80 for 2 hours. Effect vanishes after first death. Increases INT by 100 for 2 hours. Effect vanishes after first death. This Mystery Box gives you a chance to win one of the brand new Chinese New Year items - the Nimbus mount. 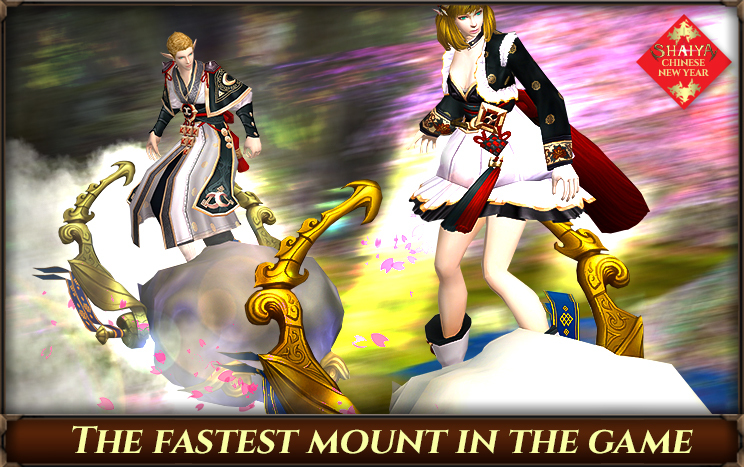 It is faster than every other mount in the game! This box contains the permanent and 30 day versions at a fair chance. Try it out now! Max Flash Mystery Box contains valuable prizes and among them, Flash Lapis Lv.3! On the top of all great opportunities you might also win one of the brand new Drogon Hatchlings. You can find a 30 day version at a fair chance and if you are lucky you can even get a permanent Drogon Hatchling! These pets grant +15 to all stats, are bound to your character, can be dyed and can be recreated! This pet will automatically collect items and gold for you. This Mystery Box gives you a chance to get one of the brand new Dragon Hatchlings It contains the 30 day version at a fair chance and if you are lucky you can even get a permanent Dragon Hatchling! 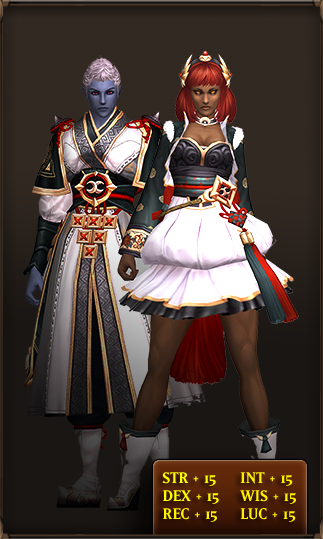 This Mystery Box gives you a chance to win one of the brand new Chinese New Year items Gentle Rerio +15 pet and Na-ye +15 costume! It contains the permanent and 30 day versions at a fair chance. Try it out now! This Mystery Box gives you a chance to get one of the brand new Grey Wind. It contains the 30 day version at a fair chance and if you are lucky you can even get a permanent Grey Wind! A special treasure that makes you feel like the Goddess has smiled upon you! 200 of these can be used to summon a weapon of incredible power if you have a summon scroll (Lv80 6-Slot Weapon). Canyon of Greed armor token. With enough of these amazing tokens you can turn them in for a powerful set piece of gear. After activated, grants 10x more EXP for 1 hour. Effect will remain even after death. The EXP bonus stacks with the Red Phoenix, Blue Dragon, and White Tiger charms! Restricted to characters currently in use. To unlock this tier, you need to spend 2999 AP! Grab a costume, hide your identity, use a potion, be invincible, and save the world! 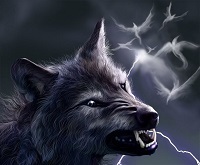 Enshroud yourself as a deizen of the darkness and become the terror that stalks the night! Not only is this costume durable, it's perfect way to show off your wicked sense of style! Doubles the points received by killing opposing faction members for 24 hours. Only effective on Blue Grade characters. Increases physical, shooting, magic critical hit rate for 2 hours. Effect vanishes after first death. Increases moving-speed slightly for 1 hour. Effect vanishes after first death. Increases magic attack power by 65 for 1 hour. Effect remains even after dying. Restricted to characters currently in use. Increases physical, shooting attack-power by 65 for 1 hour. Effect remains even after dying. Restricted to characters currently in use. This mystery box has a chance to drop a placeholder (Mileage 3000) that can be exchanged for a brand-new Luminous Upper armor piece which is a part of the Episode 8 Lv.80-C set. As soon as you have the placeholder (please don't remove from the BANK), please send us a ticket to get you Luminous Armor of Choice. This box can give you one of the most powerful elemental lapises for weapons! The Weapon Elemental Lv2.5 Chest will provide you with 1 random Elemental Lapis Lv2.5 (Phoenix, Hydra, Terra, or Storm) that can be linked to augment your weapons. These lapises give your weapons elemental augments in addition to +15 to all stats! If you bring this vial and 2 Recreation Runes to the Professional Blacksmith (in the Auction House) and combine them, you will receive a Recreation Rune (LUC). Lapis containing the sound of speed, which increases attack speed significantly. Canyon of Greed armor token. With enough of these amazing tokens you can turn them in for an elite set piece of gear. To unlock this tier, you need to spend 5499 AP! If you attempt to link the lapis and it fails, this lapis will break and the item you tried to enhance my also break. Use a Lucky Charm to prevent item breakage. To unlock this tier, you need to spend 9999 AP! This item allows you to extract 1 lapis from an item of your choice without risk of breakage. Once the item has been purchased, you must send us the information on the account that you would like to have changed using the correct request-sheet. If the above conditions are met, the GM Team will perform the extraction as soon as possible. To unlock this tier, you need to spend 15499 AP! A menacing vampire costume. Wear it and sate your thirst for blood! To unlock this tier, you need to spend 22999 AP! To unlock this tier, you need to spend 37999 AP! x2 Stackable Max OJ. This Max OJ can be applied to an item that already currently has a Max OJ applied to it. It does not provide 2 Max OJ's. To unlock this tier, you need to spend 54999 AP! One of any legal item in the game excluding Armor and episode 7 items. To unlock this tier, you need to spend 84999 AP! Links Lapises to all free slots of an item. How does it work? Place your item and the Iron Button in the warehouse and send us a ticket providing the following information: Name of item, Lapises you would like to have linked. We will provide all Lapises and link them. Then wait until service gets completed. * We will only link Lapises which are allowed by the game mechanics. Please make sure you send us a valid request!